Sweetiepie is an artist and a blogger. See more of her artwork by visiting the website listed on her profile page. 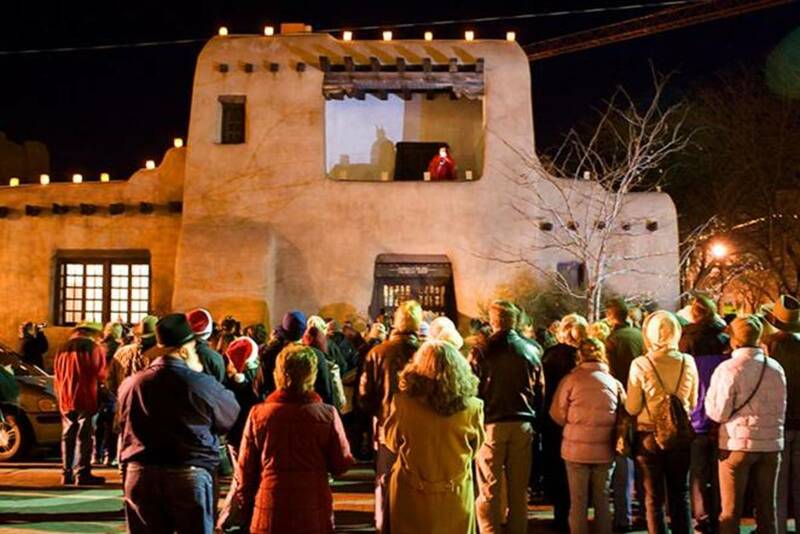 It is time to start planning out those Christmas gift lists. Some people prefer buying expensive gifts, but us creative types like to make things with our own hands. 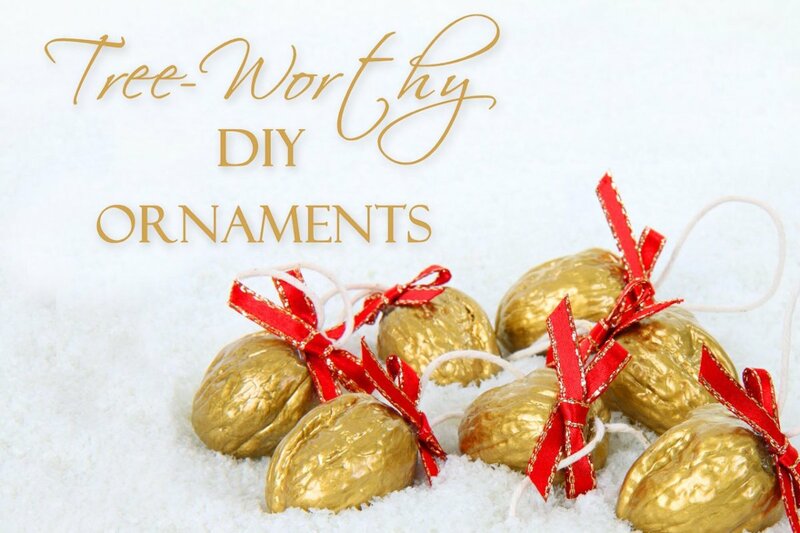 Designing handmade ornaments is a cost effective way to create gifts for people on your Christmas list, and you can use supplies from around the house to do it. 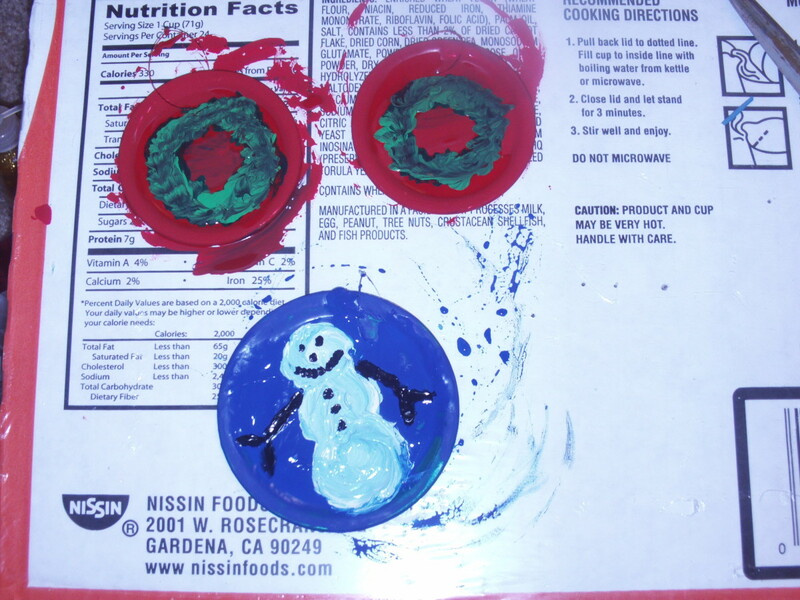 For the ornaments, I created I simply painted directly on a few lids and drew pictures that I glued on other lids. 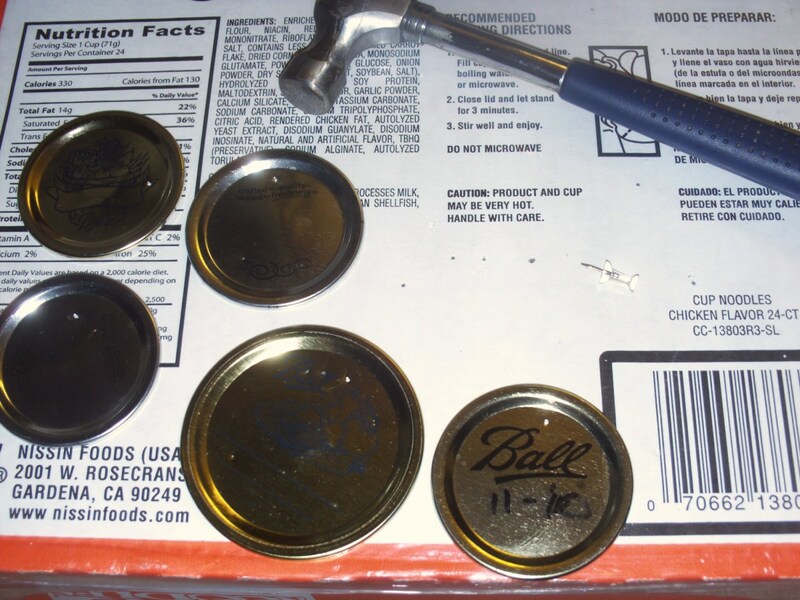 The first part of this hub will illustrate how to make ornaments by painting lids. 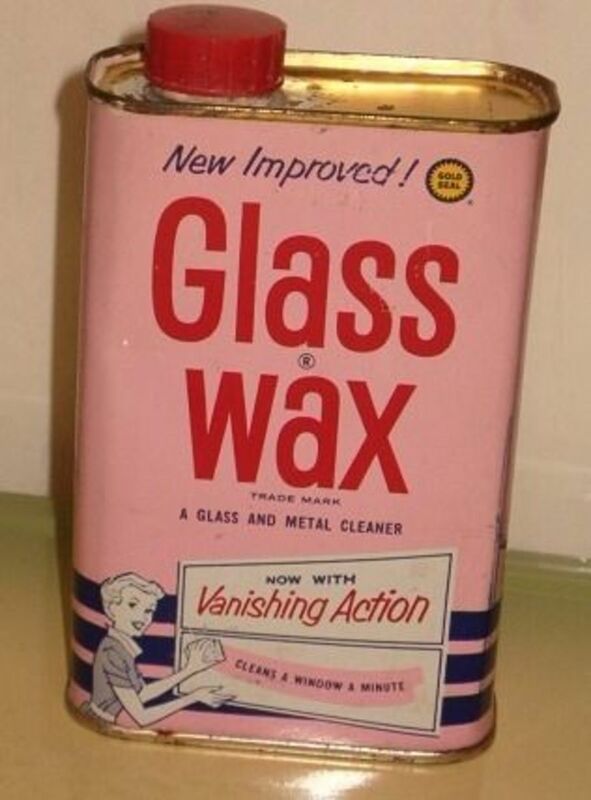 Prick a hole in the lids using a small nail and a hammer, but make sure to wear safety goggles when doing this. Make hangers for the lids with jewelry nylon. 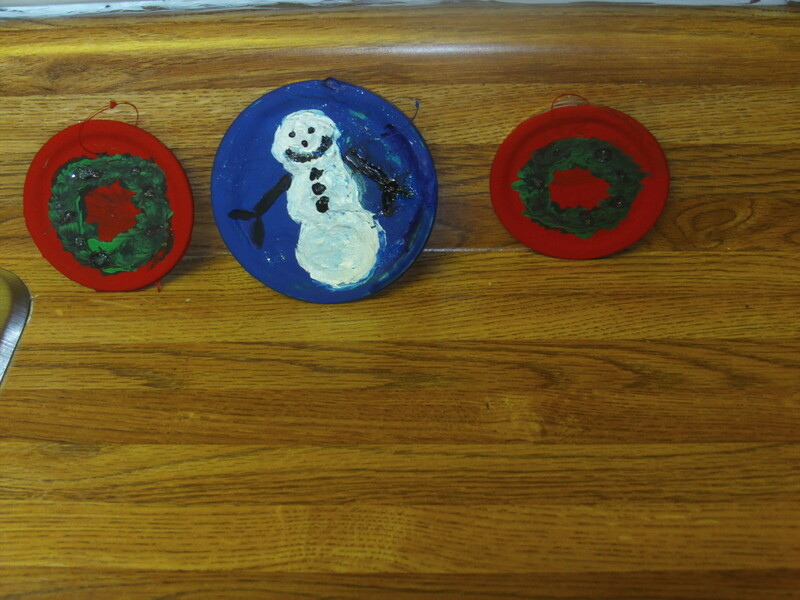 I painted Christmas themed pictures on the lids, such as snowmen and wreaths. These had to dry on the cardboard box overnight. After allowing the ornaments to dry, I applied a bit of glitter glue to the surface of each ornament with a paint brush. 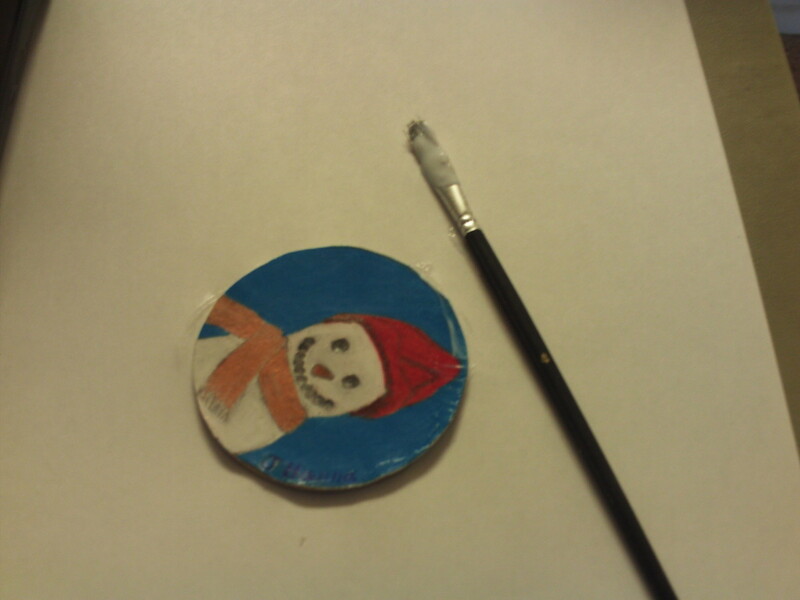 The snowman ornament below was made with my drawing of a snowman, and a canning jar lid. 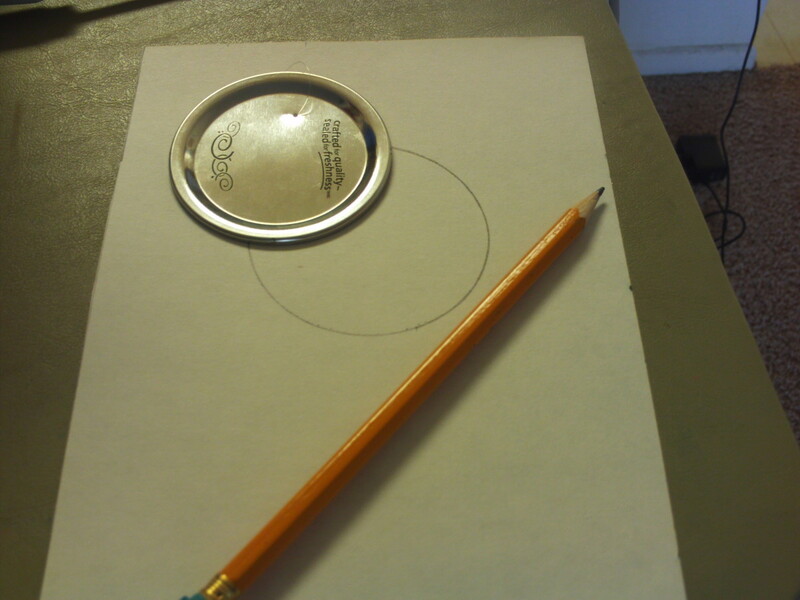 I trace around the canning jar lid with my pencil to make the cut-out for the top of my ornament. I will be drawing the snowman on this paper circle. The video above shows how I drew the snowman. 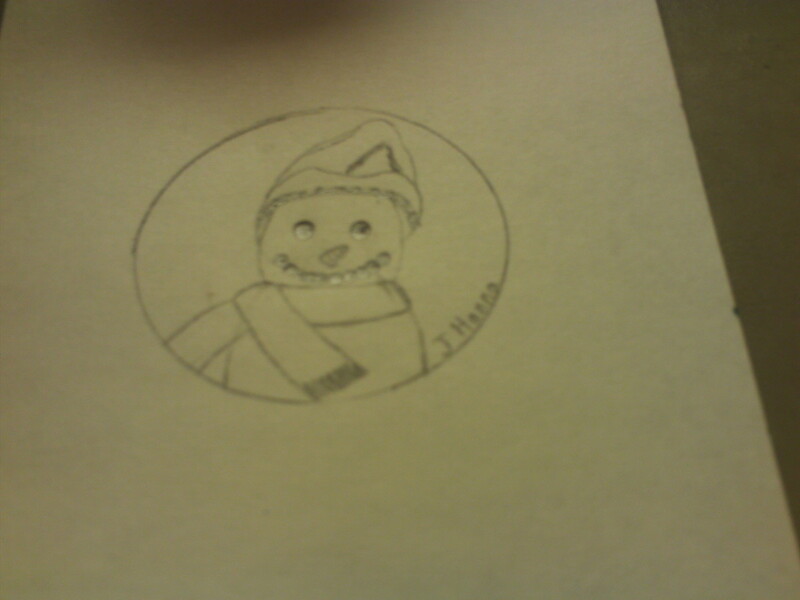 I drew a picture of the snowman inside the circle, which I shaded in with colored pencils. 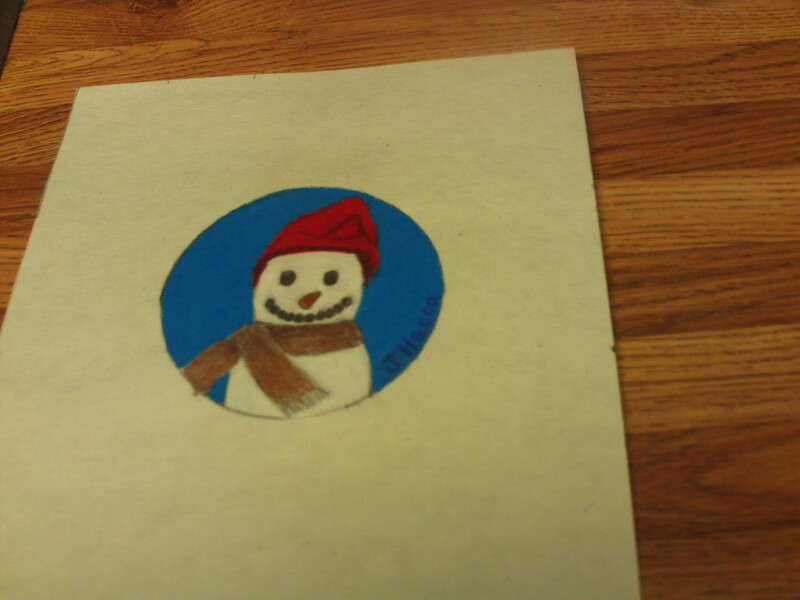 I used colored pencils to color in my snowman drawing. I quite like how the snowman looked before I cut him out. 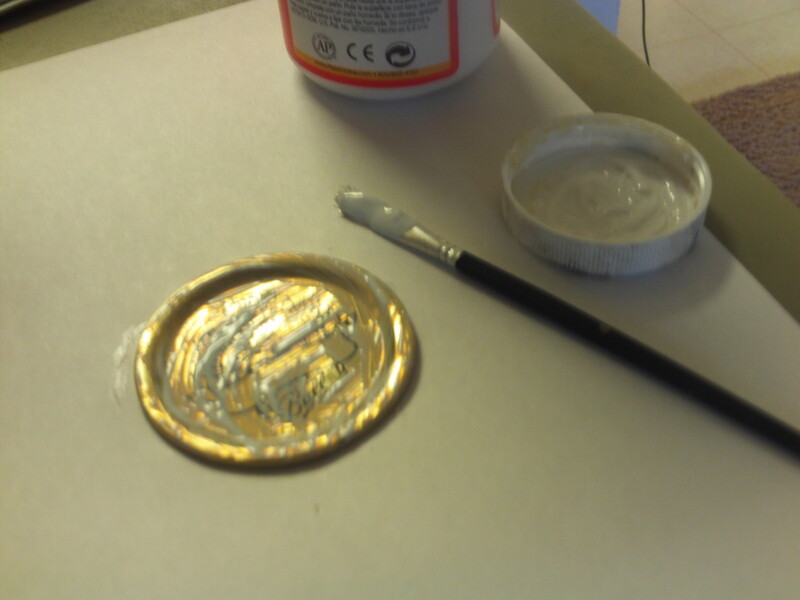 I applied glue to the canning jar lid with a paint brush. For this project I used Mod Podge glue because it is very substantial when it comes to holding paper and other items. I placed the snowman cut-out on the lid. I placed the snowman cut-out on the lid, and pressed down on it to make sure it adhered to the glue. 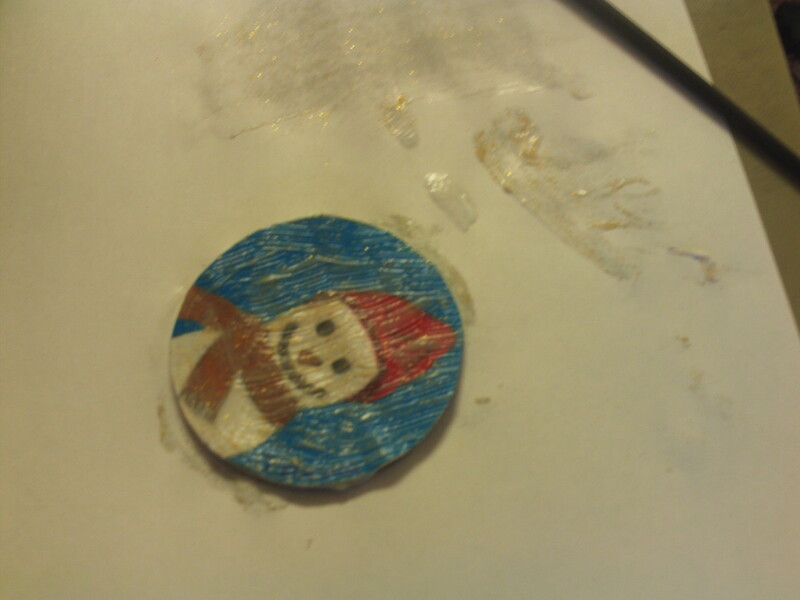 I painted a layer of glitter glue over the snowman to make it sparkle. The ornament dried overnight before I adding the hanger made out of jewelry nylon. In the video above you can see how I have spread a layer of glitter glue over the ornament, which will give it a painted effect once it has dried. 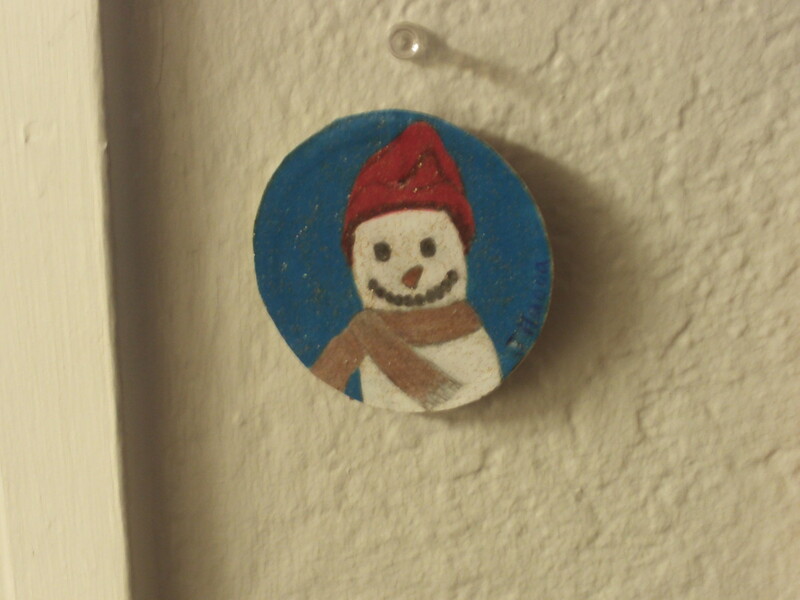 I used jewelry nylon to attach a hanger to my snowman ornament. The bit of sparkle reflecting off the ornament is quite cheery around Christmas, and much easier and cheaper than having to decorate an entire tree. My preference is just to hang up a few hand made ornaments instead. 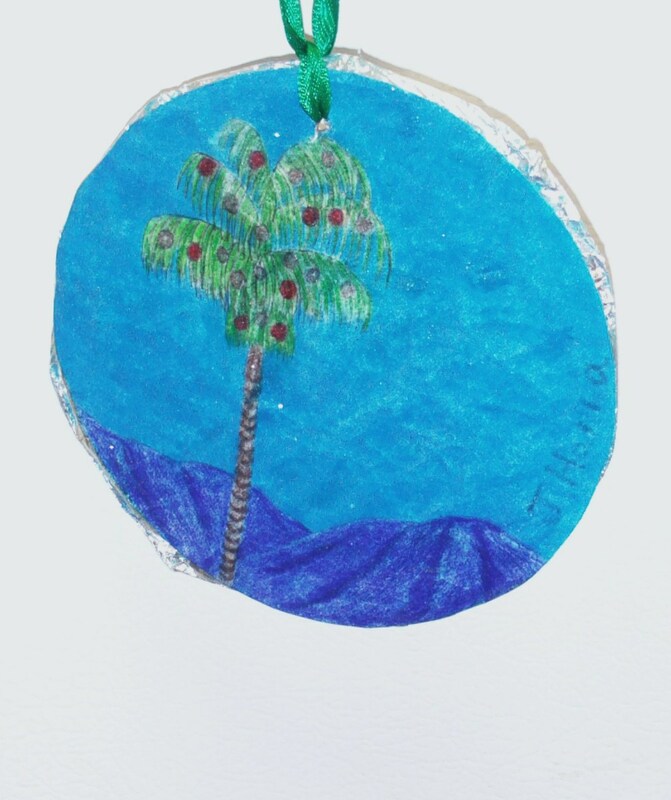 The ornament is designed with my colored pencil illustration of a Southern California palm tree decorated with Christmas balls, and the San Bernardino Mountains as a backdrop. I glued this drawing to a piece of cardboard covered with tin foil to create this handmade ornament. 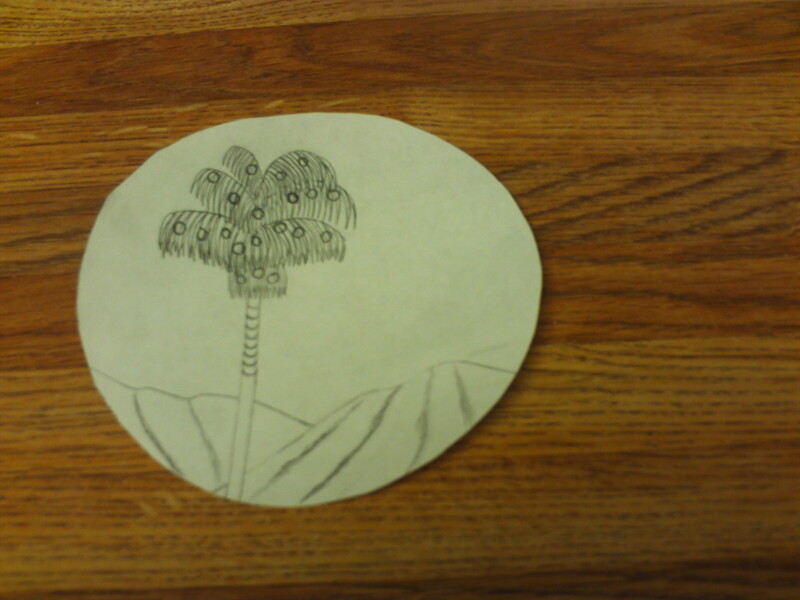 The drawing of the palm tree is based on a photograph I took with the San Bernardino Mountains as a backdrop. 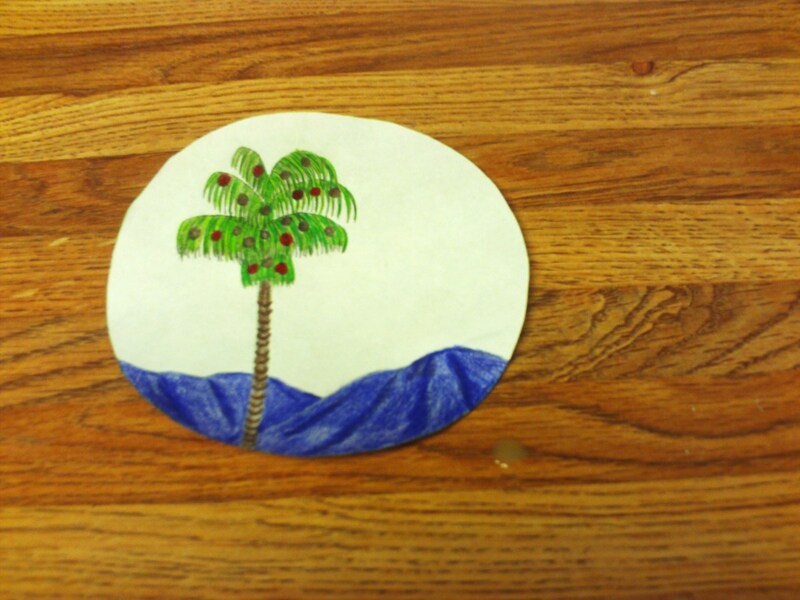 After I completed my drawing of the palm tree scene, I began coloring in the cute little palm itself. I put Christmas balls on the palm tree to make a Christmas tree with a Southern California vibe. In this phase of the drawing process I began coloring in the fronds of the palm tree. 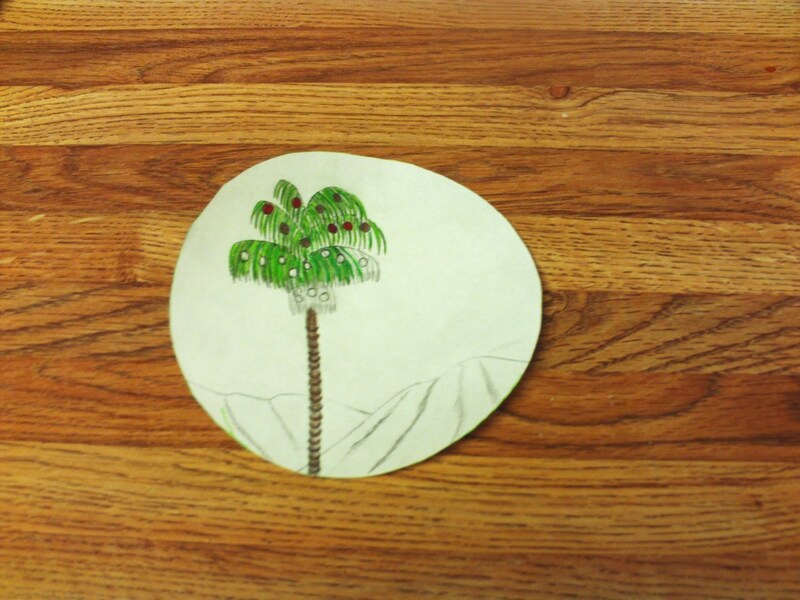 The video above demonstrates what the palm tree look like as I finished coloring it in. 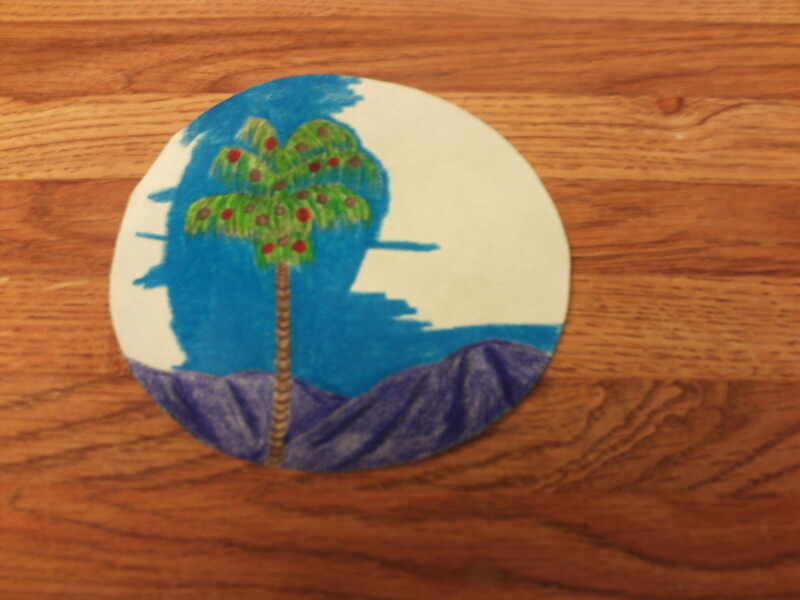 Coloring in the San Bernardino Mountains behind the palm tree. 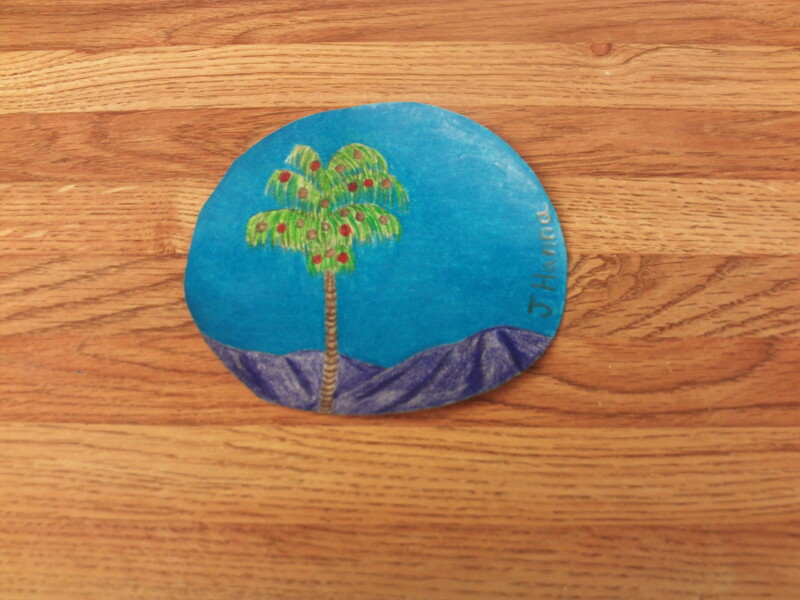 Once the palm tree was colored in, I began to shade in the San Bernardino Mountains directly behind it. This Christmas palm tree scene is based on a photograph I took here in Southern California. In the video above I am coloring in the sky behind my little palm tree. The vibrant blue is a beautiful contrast with the blue-violet color of the San Bernardino Mountains, which actually appear to be that hue from a distance. Above I am coloring in the sky for the palm tree ornament. Here is the palm tree scene completely colored in. 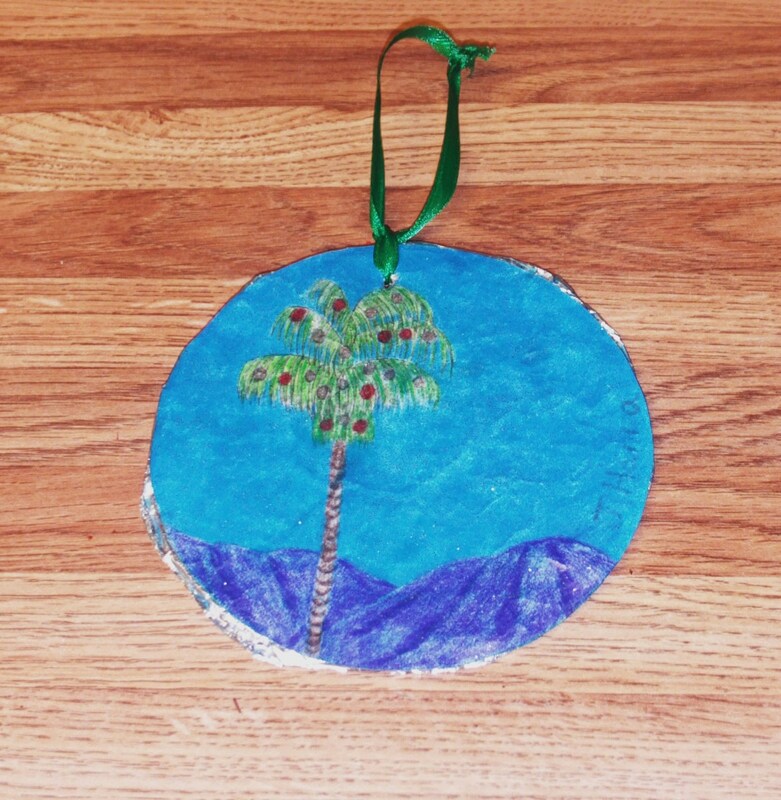 I glued the palm tree scene to a cardboard cut-out covered with tin foil, and I painted glitter glue over the ornament to make it sparkle. 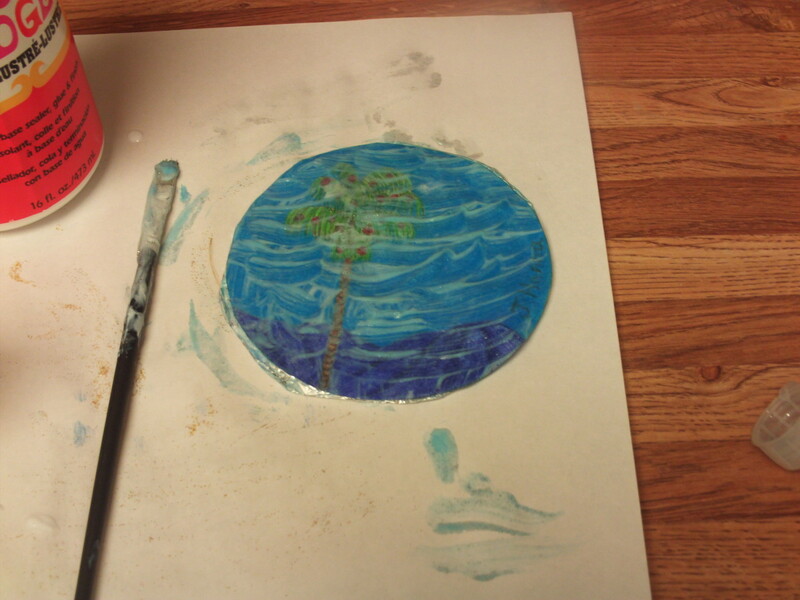 In this video I am attaching the palm tree drawing to the cardboard base, and painting on the glitter glue. A large tapestry needle to poke a hole in the palm tree ornament to attach the green ribbon. The green ribbon was tied off the make a hanger for the twinkling palm tree. Hopefully my handmade ornaments will inspire you to create some of your own, and to keep in mind not all holiday gifts have to be purchased at the store. You can make something beautiful at home. 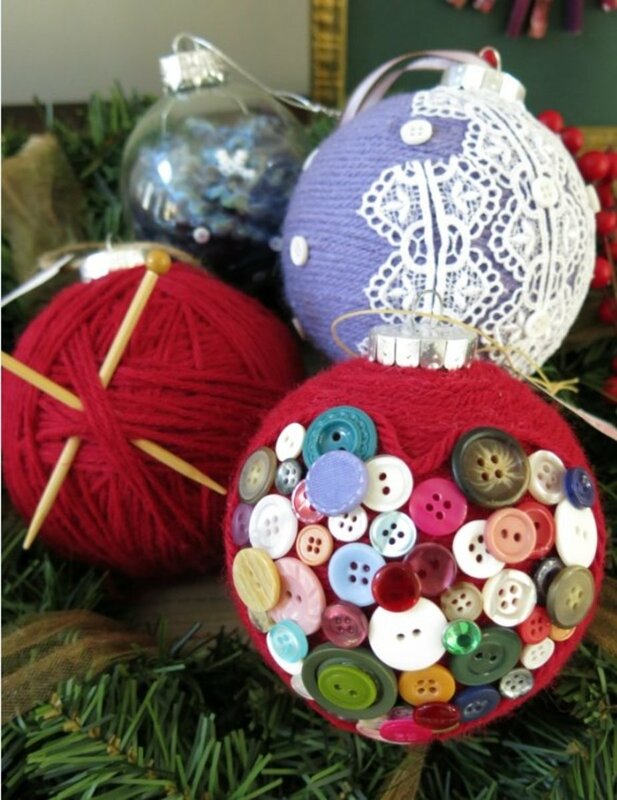 Do you like making ornaments? Only the ones I can eat, like gingerbread cookies. I think handmade gifts can be fun to create. I am not a big holiday person, but I like doing crafty stuff, so this tends to be what I make and share. Only 44 days until Christmas! 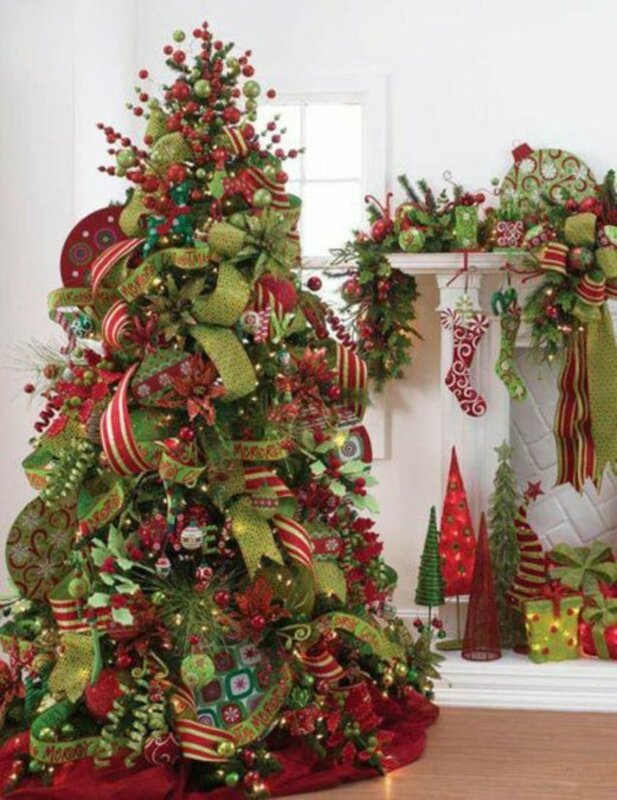 People who plan to do handmade gifts and decorations will want to get cracking or they won't be done in time what with all the other obligations that must be met in the same period of time. I like the idea of adding a handmade ornament to a wrapped gift. Good suggestion. I think that homemade ornaments are always welcomed gifts. Many years ago I crocheted little white and little red bells and gave them to many people that year as Christmas gifts. 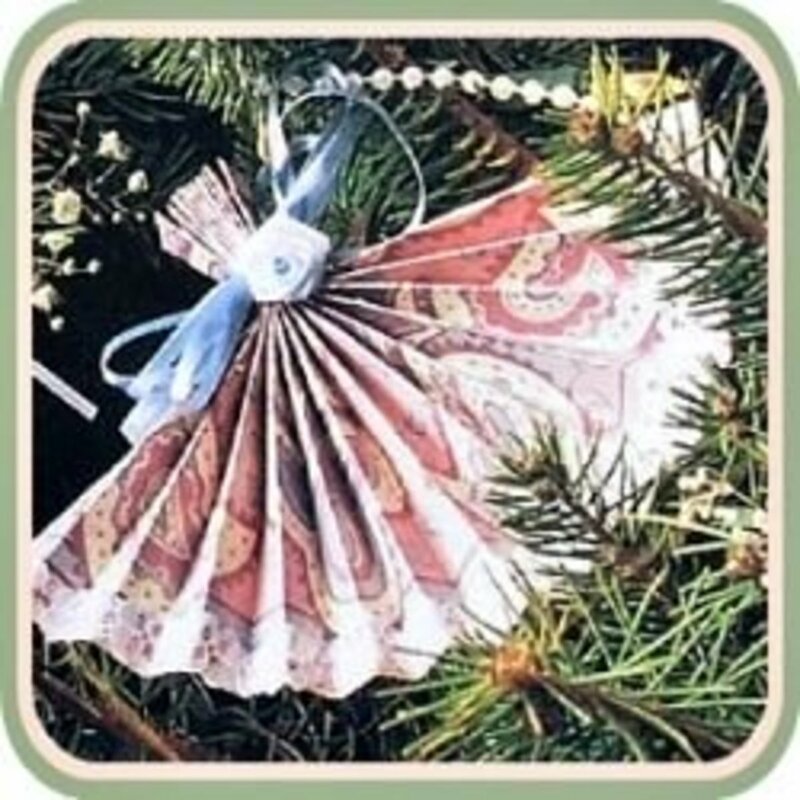 I have also made some paper ornaments using Christmas cards that were sent to us. I believe that idea came from reading another HubPage author some time ago. Your canning lids decorated for Christmas are a great idea. Lets one use their own creativity in a special way. Would be nice as an addition to a wrapped gift as well. Gift outside of the package as well as inside! I think that handmade ornaments make lovely Christmas gifts. Wonderful hub. Very special one indeed to help one to make customized Christmas ornaments. Terrific tutorial. I love your canning lid snowman, it is so cute. Very easy indeed most especially that you have great videos for a guide. Thanks for sharing this. I am sure that many will find this useful. Thanks for your lovely comments, Rodney! Excellent post! My twin daughters and I will try this out. Good to see you still posting Sweetie! @Mhatter - Thanks for liking this ornament tutorial. @Carol - Thanks, I think people can save a lot of money making their own ornaments. @Aya - Thanks, I like the palm tree ornament as well. This one has a special Southern California vibe, but it could apply to any place in the world where you find more palm trees than evergreens. 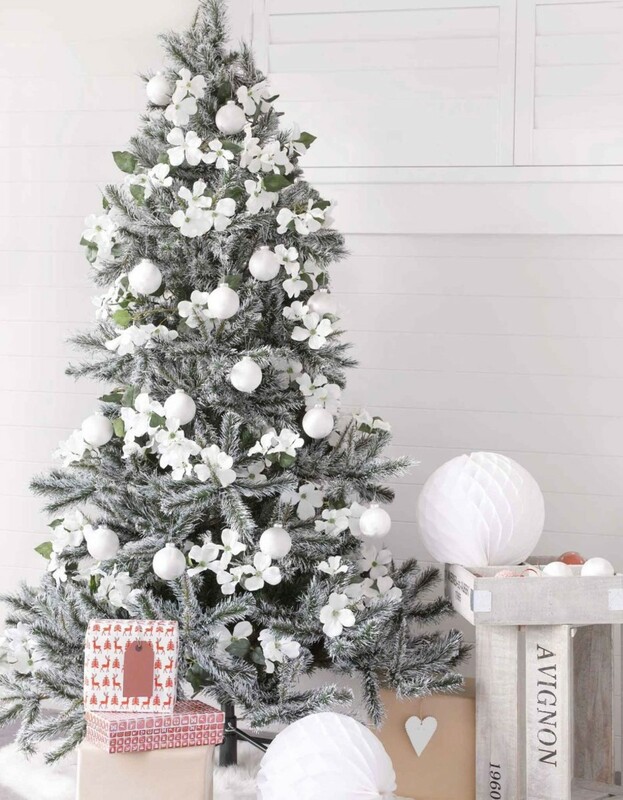 These are great ideas for Christmas ornaments. I especially like the one with the palm tree. Great idea. Thank you for this. Very cool ideas here; nice job my friend. We are making ornaments this coming weekend and this hub will come in handy.